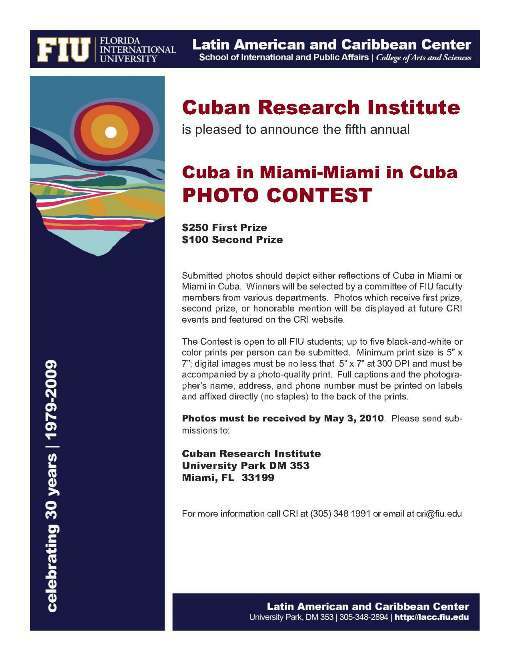 LACC and the Cuban Research Institute (CRI) are pleased to announce the fifth annual Cuba in Miami-Miami in Cuba Photo Contest, open to all FIU students. Submitted photos should depict either reflections of Cuba in Miami or Miami in Cuba. Winners will be selected by a committee of FIU faculty members from various departments. Photos which receive first prize, second prize, or honorable mention will be displayed at future CRI events and featured on the CRI website. Photo submission deadline is May 3, 2010!